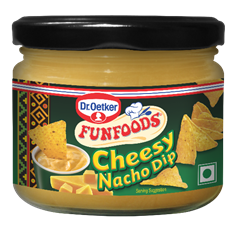 FunFoods by Dr. Oetker, a leading purveyor of western cuisine in India, adds the mouth watering Cheesy Nacho dip to its current range. Available in a 275gm pack, Cheesy Nacho dip, along with Salsa, the tomato based Mexican dip, will bring the ultimate Nacho eating experience from the cinema halls to your home. Consumers will see their favourite Salsa in an all new avatar, as both have been packaged in a convenient wide mouth jar, for a hassle free dip and eat experience. With the addition of the Cheesy Nacho dip with a slight Jalapeno flavour, the Mexican twins by FunFoods are here to add cheesiness and tanginess to your Nacho eating experience! Whether you are watching a movie with family or a cricket match with friends at home, these Mexican twins make sure you don’t go hungry! Bring home the crispy Nachos, dip them in FunFoods Cheesy Dip and Salsa and indulge your palate with the best of Mexican flavours. 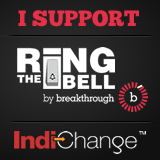 Priced at just Rs. 99, the 275gm pack of irresistible Cheesy Nacho dip and 300gm pack of Salsa dip will be available at all retail outlets. So grab the Mexican twins now and make your regular Nachos sumptuous! Oetker Group is a German conglomerate with six different business divisions namely food, beer and non-alcoholic beverages, sparkling wine, wine and spirits, shipping, banking and other interests. With about 25,000 employees, it is one of Germany’s largest family owned diversified industrial groups with a turnover of Euro 11 Bn. (approx.). The Oetker Group globally consists of more than 400 companies and has substantial interests in the food sector since 1891. Dr. Oetker is the market leader in Frozen Pizza, Home Baking and Muesli categories in Europe and is present in more than 50 countries across the world. The company enjoys an excellent reputation worldwide and has always been characterized by the highest standards of quality, taste and guaranteed (baking) outcome. The F&B division accounts for more than 50% of the revenues, with the annual turnover of the Food Division of Euro 2.6 billion as of 2014. Dr. Oetker India, established in 2007, is a leading manufacturer of branded packaged food products with a focus on western food products. 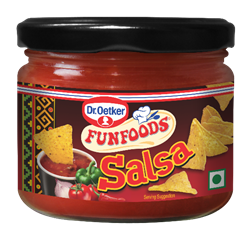 Dr. Oetker acquired Delhi based FunFoods Pvt. Ltd in December 2008 which has been present in the country since 1983. FunFoods is the market leader in mayonnaise, Italian sauces, sandwich spreads, salad dressings and peanut butter apart from being present in Chinese sauces, Mexican sauce & dips, milk shake mixes, cakes and dessert toppings. With state-of-the-art manufacturing facilities and Pan India sales network, it currently has 57 products on the retail shelves. In 2015, FunFoods by Dr. Oetker embraced an umbrella branding strategy with Dr. Oetker as the parent brand and FunFoods as sub-brand, thereby complimenting its range of products with new packaging which offer an international style and appetite appeal. The company also manufactures customised products for some of the biggest names in the food service industry like Yum Restaurants (Pizza Hut, KFC), Subway, Domino’s Pizza, Costa Coffee, Chillies, Krispy Crème, and prominent hotels all over the country.